Since soy sauce is a popular condiment, it is perfect to serve tableside in this convenient and easy-to-use 5 fl. oz. dispenser bottle. 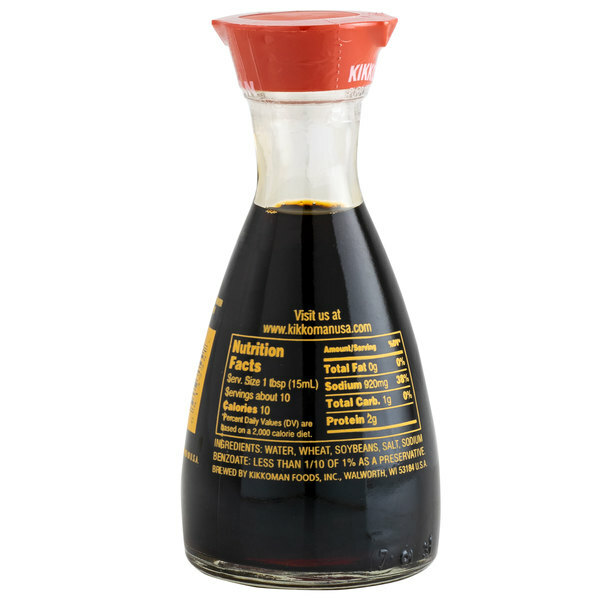 Using this dispenser bottle, your customers will easily be able to add just the right amount of soy sauce to their sushi rolls and other dishes! 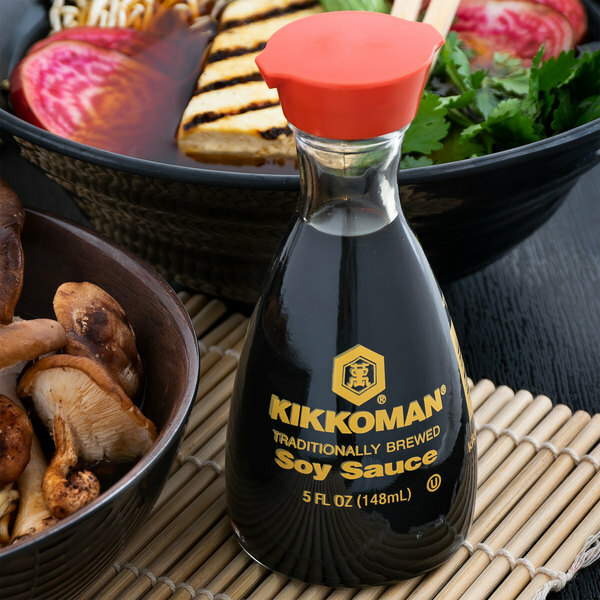 Kikkoman is the premier name in soy sauce. When our customers see this on our tables, they know they're in for a great dining experience. And, the convenient 5 oz bottle is perfect -- convenient and easy to use. Super convenient to take to catering events and don't have to worry about refilling as i can just throw them away when finished. definitely handy. Kikkoman has the best soy sauce hands down. These little 5 oz bottles are great for customers. When customers ask for soy sauce we set these on the tables for them. 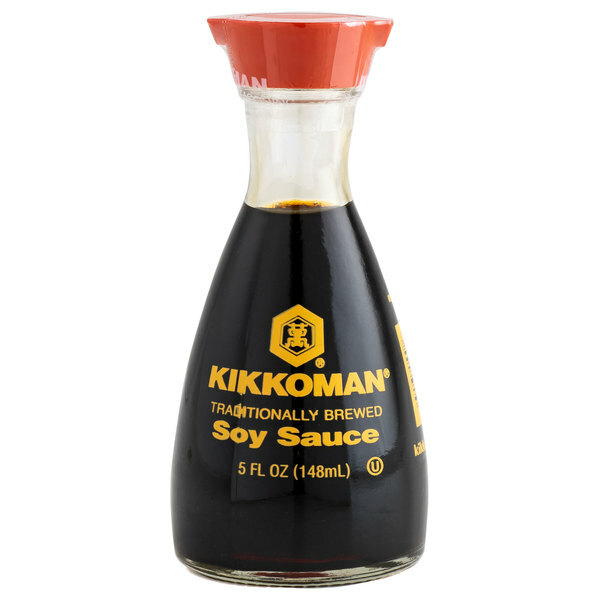 Love Kikkoman soy sauce and these little bottles were just perfect to have on a buffet table! They were wrapped well for shipping. I will buy again! 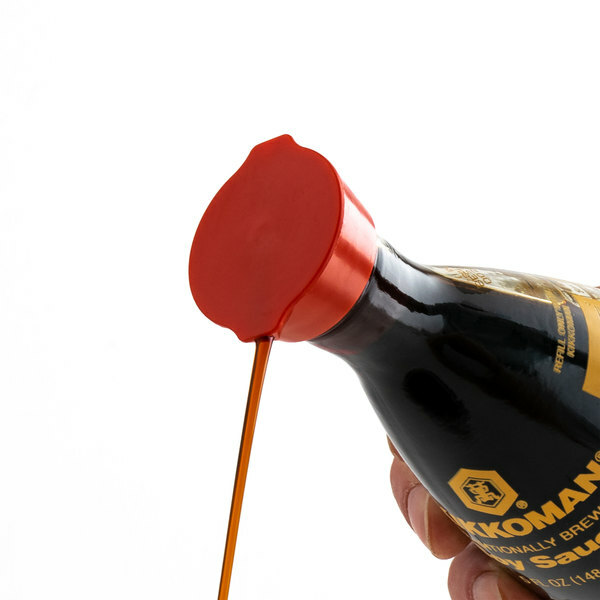 The Kikkoman naturally brewed soy sauce is great and the dispenser is very convenient. A great and easy way to serve our soy sauce with no mess. This soy sauce is restaurant quality! We use this primarily in our restaurant and at home for our own meals. If you get the serving container, be sure to get the gallon refill. It goes fast and is so good! Great soy sauce, we were never disappointed when we ordered it. Unfortunately, we no longer off the menu item this paired, s we have no use for it now, but we were very pleased. This red top Kikkoman soy sauce is naturally brewed so it is less salty than other soy sauces out there that are not naturally brewed. So basically it is more flavorful despite being less intense. We use it for making food more flavorful such as in marinades or as a soy sauce-based dips. These work great for our restaurant. Refillable and durable. What more can you ask for. Kikkoman has great quality products, and this is one of them! The Kikkoman 5 fl. oz. Naturally Brewed Soy Sauce Dispenser works very well for dispensing and the sauce is the best. I am very happy with my purchase and highly recommend. Great value! To be honest, I am not even sure that another brand makes soy sauce but why would you try? Kikkoman is the absolute best product and in this great glass jar! If you break just one and don't want to buy a whole case then this is the perfect option. This dispenser came full and we love the product. These are perfect size and easy to clean, we got them with both the red and green caps for regular and lite soy. They work great for the tables. This is so flavorful soy sauce! And I also love that nice bottle which looks great on the table! Great price and great product! I would recommend this one! I have tried this product before and I love it. Easy to refill and the taste is so good! Kikkoman is a trusted name! 5 stars! these little bottles are great. That Kikkoman's flavor and the trusted name printed on the outside is great. That they are refillable is a big plus. Very pleased with the value of this Kikkoman soy sauce dispenser. All bottles arrived properly packed and none of the seals or bottles were broken during travel. The printed nutrition label on the bottles are a plus compared to purchasing and filling empty soy sauce dispensers. Will order again! We buy big containers of soy sauce and this dispenser makes using the soy sauce much easier. It's super conveinent, we love that we don't have to unscrew a top every time we want to use it. We love it. My favorite brand of soy sauce in a cute little dispenser. Easy to pour and the shape makes it easy to hold. It's nice that it's refillable as well. Kikkoman soy sauce is a well known and respected brand. The taste is great and consistent. The soy sauce dispenser is a great size for table top service. Kikkoman brand soy sauce is has a delicate taste that isn't overly salty. It's the most widely used brand and has a taste that's familiar to just about everyone. Try the low sodium version too, it has a very similar flavor profile with 30 percent less sodium. These dispensers are an easy, inexpensive and easily refillable way dispense soy sauce at the dinner table. Depending on how much soy sauce your guests use, this package will usually last between 2 and 5 meals for a group of 4. For home use, note that the dispenser doesn't store completely sealed, so the product will be exposed to oxygen after opening and during storage. This is just like they have in restaurants. If you use a lot of soy sauce at the table, this is a cool little inexpensive addition to your meals. My kids love it. Kikkoman produces one of the finest sauces around. Combine with a little bit of garlic, pepper and salt and you have an awesome marinade. Great little jar for pouring with ease or re-filling.